The Division’s free Update 1.6 will be released at the same time as Expansion III: Last Stand on all three platforms simultaneously. 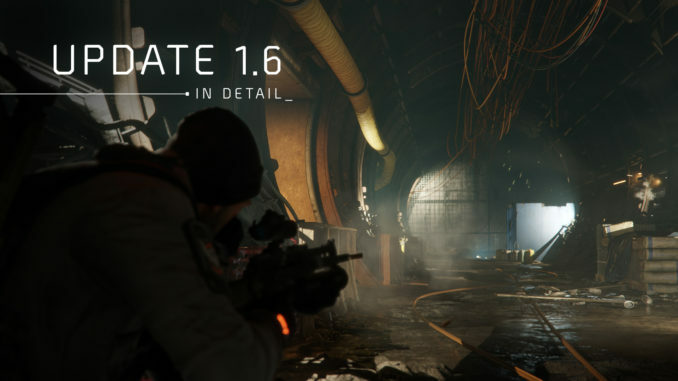 While 1.4 and 1.5 were mainly focusing the PvE aspect of the game, 1.6 will primarily address The Division’s PvP part and the Dark Zone, but will also improve the PvE experience. Both, 1.6 and Last Stand will be available to test on the Public Test Server in a couple of days, which means that the changes you will find in this article are not final yet, but already give you a preview in which direction 1.6 is heading. The go live for the PTS as well as the release date for the Update itself will be given out soon. It’s also worth noting that the next update will not introduce a new World Tier and therefore not increase the Gear Score of max. 256. Besides content changes, also bug fixes will be included in the release build, but more about that in the patch notes that will be released throughout the PTS phase and once Update 1.6 goes live. Let’s take a closer look at what’s coming. 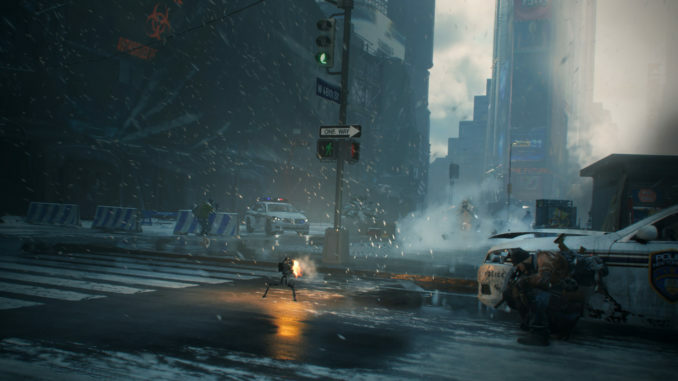 As we have already seen during the Last Stand reveal, the Dark Zone will be expanded to the North with three new areas around the Central Park – DZ07-09 – which almost double the playable size of the current Dark Zone. These new areas will come with lots of explorable vertical spaces, like rooftops and underground locations – more than what we have seen in the other 6 subzones. The amount of players in the Dark Zone will not change and stay at 24 players per instance. Because of this, farming in lower subzones, or in general, could turn the whole DZ into a more PvE friendly place, also because some of the PvP players will probably play Last Stand instead. Since Consumables aren’t applying Status Effects anymore, the Turret Skill as well as Incendiary/Shock Grenades became more popular in the past and are very powerful in combination with the Shortbow Championship Kneepads. To be able to counter these Status Effects, medkits can now be used at full health to remove certain Status Effects without having to equip a High-End mask. The Bleed Status Effect will no longer prevent you from sprinting or moving from cover to cover, instead it will slow you down in general. Status Effects will also have diminishing returns. Whenever a Status Effect is applied to you, you build up a certain amount of temporary resistance to it for a short while. Survivability talents like On the Move, Battle Buddy and Critical Save. Dark Zone Leaderboards will allow you to compare yourself with other players across a wide variety of activities on a weekly and a monthly basis. The activities are divided into PvP and PvE. PvP for example includes Rogues killed, Manhunts survived and Extractions hijacked. PvE instead is focusing on activities like NPC enemies killed, locked chests looted and items extracted. When the leaderboards reset, all tracked activities will be turned into a total score which is divided into three tiers. You gain better rewards the higher this score is. A new type of special event called Contamination Event will be added to the Dark Zone, where Elite Cleaners will appear roughly every hour in the DZ’s underground tunnels and it’s your job to stop them. Contaminated body bags have been piled up in parts of the subways below the Dark Zone, increasing the strength of the virus in those areas. The Cleaners have started sweeping these locations, burning everything in their path – including civilians who happen to get in their way. But it’s not just about shooting the Cleaners and getting rewarded for it. The contamination down there will be so high that your virus filter alone is not enough to survive. You will have to watch and manage your health as well as medkit or skill usage and act as quickly as possible to be successful. The new Landmarks in 1.6 can have multiple waves of enemies spawning after you’ve killed the initial NPCs. Because it was very annoying that some players just killed the Named Enemy for loot and headed over to the next Landmark without actually clearing the whole spot, clearing Landmarks will now award you with additional loot placed directly into your inventory, bypassing the need to extract it. Fast travel between DZ Checkpoints will be added. Similar to when you would like to exit the DZ with contaminated loot, you would also lose it when trying to teleport to another Checkpoint. Armor will no longer be a major bonus and be replaced with Health, making Health and Stamina to the main source of Toughness. With this important step, 1.6 will finally get rid of the need of having to invest every single attribute point into Armor and opens up various new build combinations at one go. Other parts of the game will be rebalanced accordingly in regard to Time to Kill and Time to be Killed. Secondly, to avoid double Health rolls, current Health rolls will turn into a new stat Resist All. Furthermore, resistances will become analogue instead of binary. This means that they lower the effect of the status effect by its percentage instead of just cancelling it out – 40% burn resist means 40% less burn damage and duration, for example. If you do manage to build up a 100% resist to a specific status effect, it will no longer have an effect on you and anyone trying to apply it to you will see a “Resisted” message in the scrolling combat text. Because there will be no new World Tier and Gear Score increase, all changes are retroactive. Skill Power will be working similar to the new Armor system. Changing the World Tier will automatically increase or decrease the amount of Skill Power that is needed for the same skill effectiveness on lower tiers. If you have a balanced build, you won’t see much difference from now, but if you’ve invested in Skill Power, your skills will become more efficient than they currently are. This in turn means that you really would have to sacrifice other stats to increase your build’s skill efficiency. Also some skills will be changed in order to make them more interesting and viable. Sticky Bombs will be detonating a bit delayed while showing a red area warning and beeping sound before it explodes. Its Flashbang mod will no longer cause the Disrupt Status Effect and fully focus on crowd control without damage. Proximity Fuse is going to be replaced with an EMP mod that works against skills and skill proxies (such as Turrets and Seeker Mines). First Aid‘s cooldown will be increased which makes the usage of Skill Power and Skill Haste more important. The First Aid Defibrillator mod will now heal in two steps; one initial burst followed by a heal over time. The Shock Turret has also seen a small change, and will no longer do any damage on its own. Signature Skills will receive a slight tweak to prevent players from activating another Signature Skill in case you already have the immunity debuff. The immunity on the other side will be increased from 30 to 60 seconds. Tactical Link’s damage will be reduced in PvP, but will stay the same in PvE. For many players out there the current content the game is providing is not difficult and challenging enough. Experienced players or those who have decent gear are already able to complete Story Missions and Incursions on Heroic with ease; and that’s where the new Legendary difficulty mode comes into play. The Legendary mode is really going to test your build, your tactics and your group synergy. While the objective in aforementioned missions stays the same, the previous content regarding enemies will be replaced with more powerful and much smarter enemies from the Last Man Battalion who will react to your skills and Status Effects. If you’ve fought the Hunter in Survival, you have had a brief taste of what is coming. It should still be possible to solo these missions, but like Incursions, they are primarily designed and intended for organized group play with dedicated roles. It’s not about having enough damage to melt their health bars, but more to “deal with their tactics and strategies” the developers say. Also nice is the fact that the Legendary mode will reward you with exclusive vanity items that you can’t get anywhere else in the game, besides tons of other loot drops of course. It’s planned to add this mode to more missions in the future, but based on the current mission state, we will see if this is really going to be happen. Fingers crossed! In Update 1.6, Named Items and Weapons will become Exotics. It will turn into an additional item rarity to the ones we already know. Moreover, some of those items will get their own unique color coding to make them stand out from the rest of your items, so will the drop color of these items change. Each of the items have also received flavor and lore text on their item descriptions, which makes them even more unique. Hungry Hog (Glutton Talent): Killing a target increases your damage dealt by 20% until you stop firing. Tenebrae (Lights Out Talent): Destroying an enemy weak point resets skill cooldowns for you and nearby group members. As The Division’s Community Manager Matt Shotcha has mentioned during a livestream, the Famas Assault Rifle will also turn into an Exotic Item in 1.6. All these changes will be retroactive. Similar to the existent Gear Sets, 1.6 will introduce Exotic Weapon Sets. An Exotic Weapon Set requires you to equip two specific Exotic Weapons to unlock their talent, which are designed to synergize with each other when their talents become active. The Valkyria is one of them and will be split into two – the Hildr and the Eir. Sealed Caches, Weapon Caches, Gear Set Caches… Exotic Caches is another way to obtain Exotics as they will guarantee an Exotic Item drop. Those will be given out as a Weekly Reward when completing Legendary missions. As expected, 1.6 will also change some Gear Sets in order to bring them back on par with all the other ones, especially AlphaBridge, which was dominating The Division’s PvP scene. Next to balancing improvements, the update will also add a new Gear Set called SEEKR. The AlphaBridge 4-piece bonus now shares the free talent (the one which doesn’t require any stats) from your weapons instead of all three (except from Exotic weapon talents). This change is not final yet and the test phase on the PTS will decide whether further changes are needed or not. Frontline’s 4-piece no longer removes the critical hit chance, instead it removes the effect of any mods (Reactive Targeting, Assault Shield, Kinetic Breaker) you have applied to the shield. The new Gear Set SEEKR will focus on body shots. Its 4-piece bonus will give you a guaranteed critical hit after landing two consecutive shots to the body (which can be spread out across different enemies). 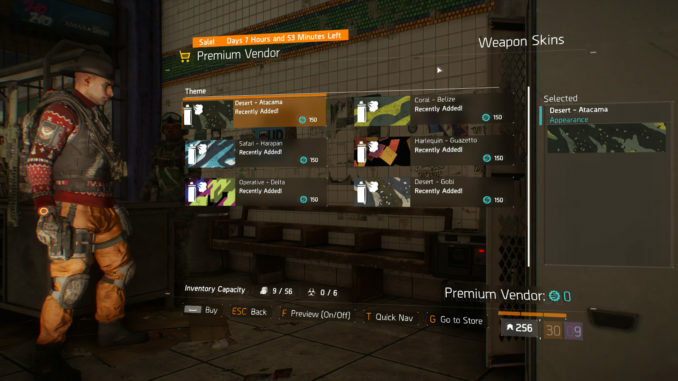 A Premium Vendor will be added to the game who will be offering an extended range of new cosmetic and other expression items which can be purchased with the new Premium Credits currency. Premium Credits can be purchased in exchange of real money and are account bound, but will be shareable between all your characters. There is no way besides real money to obtain this currency except for a Uplay Reward which can be unlocked when 1.6 is available. This special vendor will be also located in the Terminal below the Base of Operations. Want to know more about this feature? Visit the official Premium Credits FAQ. From now on, all activities reward their own separate experience points and award their own caches. For example in Underground you will only receive experience points towards your Underground Rank. This change is not really understandable since it forces you again into certain activities to benefit from Field Proficiency. The recalibration limit for items will be removed in 1.6, meaning that you will be able to recalibrate them as often as you want while the price increases each time and caps out at five recalibrations. Speaking about the price, expect some price tweaks for Gear Sets and Exotic Weapons. Helping civilians will reward you with Intel. Scavenger Box will scale with the World Tier. The Survival DLC also received some changes. First of all the matchmaking for solo players will be fixed so that they cannot longer end up in games with groups. Furthermore grouping up in PvP Survival games has been disabled and reviving a downed player will always cost a medkit. High-End pistols in Survival mode will no longer cost Division Tech. What do you think about these changes? With Update 1.6, the developers seem to be really trying to finish what they have started with Update 1.4 some months ago – to make The Division great again! We are excited for this next update and escpecially the Last Stand game mode. Stay tuned!